In chronic disease management, patients are increasingly called upon to undertake a new role as lay tutors within self-management training programmes. The internet constitutes an increasingly significant healthcare setting and a key arena for self-management support and communication. This study evaluates how a new quasi-professional health workforce – volunteer tutors – engage, guide and attempt to manage people with long-term conditions in the ways of 'good' self-management within the context of an online self-management course. b) how participants responded to and interacted with facilitators. Emergent themes included: techniques and mechanisms used to engage people with self-management; the process facilitators followed – 'sharing', 'modelling' and 'confirming'; and the emergence of a policing role regarding online disclosure. Whilst exchanging medical advice was discouraged, facilitators often professed to understand and give advice on psychological aspects of behaviour. The study gave an insight into the roles tutors adopt – one being their ability to 'police' subjective management of long-term conditions and another being to attempt to enhance the psychological capabilities of participants. Healthcare settings are becoming evermore varied and boundaries of expertise are shifting alongside contemporary cultural and policy changes. 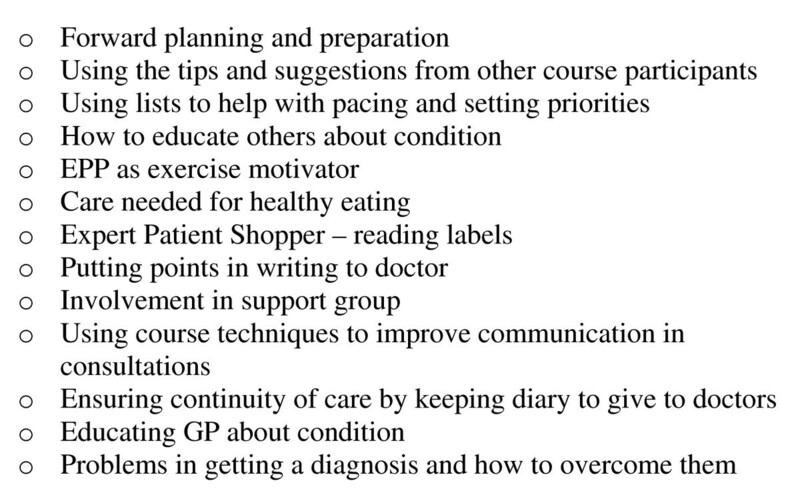 In chronic disease management, patients are now cast as 'experts' increasingly called upon to undertake a new quasi-professional role as lay tutors within self-management training programmes. This section of the health-care workforce is valued not for any medical training they may possess but because of their experience of living with a long-term condition. Access to self-management programmes for high numbers of people with long-term conditions has been made possible because of a large volunteer workforce of trained tutors; this group is the focus of this paper. In particular, we are interested in how individuals tasked with running an online self care support programme attempt to achieve the overarching policy aims of engaging and managing people with long-term conditions in self-management. The internet constitutes an increasingly significant interactive healthcare setting and is increasingly becoming a key arena for self-management support and communication. There are tensions in using lay people to teach others how to self-manage which relate to the value placed on their expertise and ability and on the limits of what they are able to teach. Prior  attempts to draw a boundary around the expertise domains of patients and health professionals; lay knowledge and expertise is concerned with the experiential which means it is invariably limited, idiosyncratic and generally based on one case. Prior argues that for the most part, lay people are not experts as they are unskilled in medical fact gathering or diagnosis (the domain of the health professional); in other words, lay people can be wrong. However, there is consensus that lay people can be deemed to be experts in the day-to-day experience of living with a long-term condition. A review of lay-led self-management  found that the literature is represented mainly by the work of Lorig and colleagues who contend that as their research shows no significant differences in patient outcomes between lay-led and non lay-led approaches (ie professionally led or mail delivered), then financial benefits favour a lay-led approach. [8–10] However, Taylor and Bury argue that there has not been enough comparative research to justify claims that self-management courses should be lay-led. The term 'peer' education is mostly used to the field of health promotion in relation to sexual health, smoking and drug use; whereas 'lay' education is more frequently associated with self-management of long-term conditions. Most research has concentrated on lay or peer educators' experiences or the processes of implementing initiatives. [12–16] Such work has found that lay people, although initially apprehensive, generally enjoy the experience and gain personally from it. Larkey et al studied communication strategies used by peer educators in a worksite intervention designed to change dietary habits. Their analysis outlined ways in which peer educators used social influence to change behaviour including: teasing; mock competition; role modelling; giving material; creating context; foot-in-the-door; encouragement; and responding to needs. There were gender and cultural differences in the strategies used and different strategies were used in group or individual contexts. Explore how facilitators engaged participants in issues related to self-management. Explore how facilitators viewed their role and the effect this had on the way they interacted with participants. The EPP Online course was run as a joint venture between Stanford University in the USA and the UK Department of Health and the quantitative results have been published separately. Researchers at the National Primary Care Research and Development Centre were commissioned to undertake a qualitative evaluation of the online course. All course participants gave informed consent, were aware they were taking part in a closely monitored pilot scheme and that researchers would have access to their online postings. Ethical approval was obtained from an NHS ethics committee (Northern and Yorkshire MREC 05/MRE03/31) and Stanford University Institutional Review Board. Data from the postings to each class by participants and facilitators were entered into an Access database and codes and comments created within Atlas.ti. The entries from the discussion centres for all respondents (participants and facilitators) were merged into a text file for each weekly session for each class. This allowed a narrative reading of the classes to give an overview of how the facilitators dealt with queries and problems and to pull out patterns of responses. A coding framework was then created relating to the specific posts of the facilitators and the analysis focussed on emerging themes related to engaging participants in self-management. Whilst only the postings from the facilitators have been included and considered in this analysis, these are set within the narrative context of each class. All the quotes are presented as they were typed by participants; we have not corrected typos or spellings. The facilitators used a number of techniques to engage people with self-management. The way the facilitators worked followed a process of sharing, modelling and confirming (see figure 1: Model to show the process of engaging participants with self-management). Model to show the process of engaging participants with self-management. Facilitators built on the input of the group to dispel fear and isolation associated with living and managing long-term conditions by emphasising the commonality of problems and feelings and trying to get participants to say 'Yes, I feel that too'. This was an attempt to develop a groundswell of belief that action was possible – by implicating that there were others out there with the same symptoms and feelings who were able to cope. There was general encouragement to share rather than contain experiences and facilitators quite often depicted themselves as being vulnerable and weak as a means of trying to relate to and engage with participants. Sharing of experiences also encompassed the day-to-day difficulties, inconveniences and suffering of living with a long-term condition. The sharing and relating of experiences was often done in a jokey; 'clubby'; 'we're all in this together' way. Being a role model is a strategy EPP course leaders are taught to enhance the self-efficacy of course participants. This strategy was used in a variety of ways in the online version. On many occasions, modelling was used to showcase the benefits of the EPP itself. There was a detectable 'evangelical' edge to much of the advice given by the facilitators. This has been noted in other work related to the role of self care skills trainers,[1, 30] in particular the way policy rhetoric and the enthusiasm of some course participants have been combined to portray the programme as a life changing event in order to promote and sell the course to participants and health care organisations. Participants were encouraged to use the strength of the techniques introduced on the course to 'transform' themselves. Facilitators gave examples of how the course had changed their own behaviour and attitude. Throughout every class, facilitators modelled examples of what was viewed as 'good' self-management (see figure 2: Examples of good self-management modelled by tutors on class 64). However, facilitators sometimes turned this strategy on its head and modelled (in a confessional manner) how they used to behave before they learned how to be an exemplary self-manager (inevitably as a result of going on an EPP course). Examples of good self-management modelled by tutors on class 64. There was an emphasis on the need to be a 'responsible' self-manager and on what Frank has referred to as the hard work of being successfully ill. Facilitators gave examples to depict this; however, they also added caveats such as the limitations placed on them by their symptoms flaring up. A great deal of modelling and advice drew on the concept of gaining and retaining a positive attitude. Facilitators made a point of congratulating the participants on all their achievements and held up certain posts which emphasised free will and choice as good examples of self-management. Such comments positively reinforced self-management actions and participants were encouraged to be proud of their success and for being responsible citizens. The facilitators attempted to demonstrate how people could reconstruct their stories so as to emphasise positive ways lives are changed by having a long-term condition (a silver lining ethos) such as new skills learnt and gain in terms of strength of character (becoming a better person). Part of the process implied another type of reconstruction – that of changing seemingly negative and depressing incidents or thoughts into positives, a standard technique used in cognitive behavioural therapy. These aspects of quasi positive psychology were introduced during the 'self-talk' section of the course where participants were encouraged to change the way they talked and thought about problems and emotions. The second quote illustrates the difficulties for facilitators in achieving this online, the facilitator has stepped in with a solution rather than leaving the individual to think through the changes needed. The analysis found a number of areas where facilitators exhibited contradictory approaches to a particular issue. Throughout the course, facilitators placed an emphasis on the commonality between people with long-term conditions using phrases such as: 'you are not on your own'; 'I've got that t-shirt too'. However, people came on the course because of their long-term medical condition and often posted condition specific queries. Facilitators' general response to such queries was to block them ('the course is not designed to deal with medical problems') and requested the participants not to give medical advice to each other (contra to peoples' wishes and expectations). However, in practice, facilitators often contradicted their 'commonality' generic approach and adopted an 'everyone is different' approach with advice to seek medical help. An anonymous online course allowed people to be open about their problems or opinions. However, facilitators appeared to be sensitive to the risks of allowing a free for all and were concerned that certain opinions or approaches to life might prove upsetting. So the facilitator's role was both to enhance and constrain interactions in ways which conformed to what was viewed as appropriate. In actuality, there were very few examples of facilitators having to actively 'police' and constrain postings although facilitators were alert for any disrespectful posts. One aspect of the policing role was the license to comment on participants' behaviour in ways which were not motivating or enabling but which adopted a moral tone about expectations of normal good behaviour. The facilitators were influenced by policy statements concerning the role of self-management in reducing the burden of long-term condition management on the NHS. They were keen to extol self-management as the potential saviour of the NHS in that it saved money by keeping people healthy and out of the system. The following quote also exemplifies how facilitators expound the win win aspects of self-management because as well as helping the NHS there are potential rewards for the individual in focussing on their own worth. The converse to this was that facilitators also felt their role was to act as consumer champions and encourage people's 'right' to use NHS services, for example in seeking a second opinion. Signposting people to their GP was a frequent response to queries of a medical nature. The facilitators seemed to work on the implicit rule that giving medical advice was not 'allowed' and did their best to suppress any attempts to do this. It did, however, appear perfectly legitimate to give psychological advice and many facilitators seemed happy to adopt a quasi counsellor role. Certainly, the stated intent of the course developers was to change people's behaviour and attitudes by increasing individual levels of self-efficacy and the notion of promoting individual change seemed to segue fairly naturally into lay interpretations of the language of psychotherapy. Other facilitators recognised that the session was problematical and probably did not fit well with the rest of the course content. One or two felt strong enough in their convictions to be openly questioning about the rationale for including 'Living Wills' and were honest in admitting difficulties in moderating the discussions that it generated. Access to the interactions of facilitators and participants on online EPP courses has illuminated the techniques and process used by lay leaders to turn people with long-term conditions into socially responsible self-managers. The analysis presented here was limited to assessing the methods and approaches online facilitators used to engage participants with self-management; the views and outcomes of participants will be the subject of different analyses. The techniques used followed a pathway of sharing, modelling and confirming. Community tutors selected to be online course facilitators were considered by EPP managers (and by themselves) to be those most experienced in delivering the community version of EPP and strong advocates of the course. The idea of a state-endorsed self-management course led by volunteer lay-leaders (the EPP) has come to seem very attractive to policy makers. The political drive to increase people's responsibility for management of their conditions fits with the sociological concept of 'ethopolitics' – the politics of life itself and how it should be lived as proposed by Rose. Rose proposes that, in western democracies, our personalities, subjectivities and relationships are not private matters but are intensively governed by state bureaucracies, policies and initiatives. In the late 20th century, a new group of professionals has developed with expertise in subjectivity who claim to 'understand the psychological aspects of the person and to act upon them or to advise others what to do' (page 3). He calls this group 'engineers of the human soul'. It could be argued that volunteer EPP tutors have been given dispensation and power from the state to mould and guide people with long-term conditions in ways to become better self-managers. The 'online' policing role adopted by facilitators was characterised by two aspects: checking the acceptability of the postings; and a more over-arching aim to promote responsible citizenship. Personal examples of the difficulties of living with a long-term condition were used as opportunities to sell the EPP to show how the course could be utilized to change attitudes and behaviour. The moral tone that facilitators sometimes resorted to was both an indication of lack of exposure to the theories and methods used by adult educationalists (where the role of the educator is to enable and support the pupil to learn for themselves) as well as a mark of the strong need the facilitators felt to be advocates for the EPP. In this respect tutors are no different to health professionals struggling to engage with supporting peoples' efforts to self-manage. In previous research we have shown that there is a need for education to equip professionals with such techniques to work effectively with patients dealing with the longer-term effects of chronic illness. Being strong advocates meant they defended the course content even when it at times caused obvious upset, such as during the session on advanced directives. Facilitators were keen to increase participants' responsibility for self-managing and often professed to understand and give advice on psychological aspects of behaviour. However, the exchange of what was seen as medical advice amongst the participants was discouraged. The EPP course is firmly rooted in the psychological concept that improvements in self-efficacy will lead to changes in behaviour – this is the main self-management technique taught on the course (through goal setting and action planning). Facilitators also drew on other psychological approaches, for example encouraging participants to reconstrue how they viewed themselves in the 'self-talk' section and turning negative views of life into positive thoughts and actions. They did this by modeling their own previously 'bad' behaviour and by confirming responses that concurred with a model of positive transformational change aka Prochaska. It does appear that in this aspect, facilitators were going beyond the boundary suggested by Prior of being experts in the experience of living with a long-term condition and stepping into the more psychological role of a counselor. The quasi psychological approach used by facilitators equates with aspects of the positive psychology movement. We know from previous research with the EPP that this approach is frequently seen as beneficial by participants. Nonetheless it is clear that such an ethos may also be vulnerable to the critique of such an approach which suggests that such an approach can start to form a type of tyranny in emphasizing the positive advantages of having positive thoughts and attitudes because those who may find it difficult to transcend pain and the difficulties associated with having a long-term condition may find such an approach adds 'insult to injury'. The selective recruitment and drop out rates of those attending the EPP may be indicative of this. Additionally, we have found indications of resistance to this ethos from course participants. Responses and posts from the facilitators were consistently very positive and encouraging. An analysis of language used in online support groups, found that women in particular tend to use superlatives and express strong feelings. Bar-Lev  contends that emotional discourse online aims to produce intimacy between strangers and impose a moral dimension to the dynamics of exchanges. These findings are likely to be applicable to lay tutors on community courses as any differences between the community and online course seem to be related to the intensity and depth of response (more apparent online) rather than techniques of engaging people with self-management. This study provides insights into the roles on-line lay tutors adopt – one being their ability to 'police' subjective management of long-term conditions and another being to attempt to enhance the psychological capabilities of participants. The generic nature of the course allowed the sharing of common experiences, but led to certain tensions for the facilitators, particularly around participants' expectations of getting medical advice. The reliance on volunteer tutors to teach self-management skills is attractive to policy makers, but those who select, manage and train volunteers for such posts need to be aware of the tensions resulting from delivering a highly structured course to people with diverse and unknown needs and consider whether lay tutors require additional training to gain skills in techniques to encourage behavioural change. Anne Kennedy, Anne Rogers, Caroline Sanders, Claire Gately and Victoria Lee contributed equally to this work. We would like to extend grateful thanks to Professor K Lorig for facilitating access to the discussion boards and Phil Ritter for his work in extracting and anonymising the postings from the classes (both of Stanford University). All authors involved in the study were funded by the Department of Health as part of an evaluation of the Expert Patients Programme. The EPP Online was funded by the Department of Health. The funding body was not involved in the study design; collection or analysis of data or in the writing of the final manuscript. AK carried out the initial analysis of the raw data from the postings to the online course and drafted the manuscript. AR assisted with the analysis and contributed to the manuscript. CS read the raw data and confirmed the emerging themes. CG and VL interviewed the facilitators and contributed to discussions around the themes. All authors participated in the design and co-ordination of the study and approved the final manuscript.